There can be only one — or two. 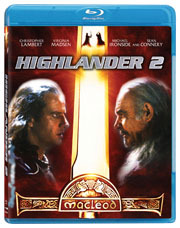 Highlander and its sequel Highlander 2 was released on Blu-ray on Nov. 2, 2010, from Lionsgate. Starring Christopher Lambert and Sean Connery as members of a legion of immortals, Highlander was released in theaters in 1986, with its sequel following in 1991. The science-fiction film franchise spawned two more movies, a TV series and a videogame. 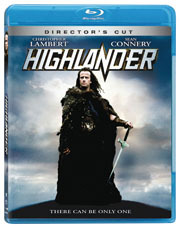 In R-rated Highlander , released on Blu-ray as a Director’s Cut, Scottish clansman Connor MacLeod (Lambert) discovers his immortal status from mentor Connery, then, centuries later in New York, he must face a showdown with other immortals until only one survives. 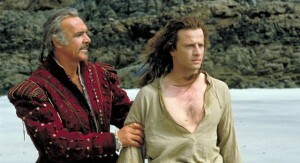 Highlander also features the music of British rock band Queen. In Highlander 2 , also rated R, the year is 2024 and MacLeod must save planet Earth from ozone depletion and corporate greed. and audio commentary with director Russell Mulcahy and producers Peter S. Davis and William N. Panzer. and the original theatrical trailer. On Blu-ray, both movies are in 1080p 16×9 widescreen video. The audio for Highlander is 5.1 DTS-HD, and Highlander 2 is 7.1 DTS-HD. Each Blu-ray is priced at $19.99.